Women are beautiful beings. Dynamic and strong, they represent strength in all they do and endure. Women have had second-hand power and are slowly making their way to the top of the ladder. When speaking of women, one needs to be educated, vulnerable, knowledgeable, and imaginative. There has to be an elegance in the narrative. One needs to feel the punch in the gut when one takes on the challenge of writing a graphic novel that focuses on a woman’s breasts. The entire novel is touted as a celebration of coming of age, breaking rules, and becoming yourself. However, it is anything but that. 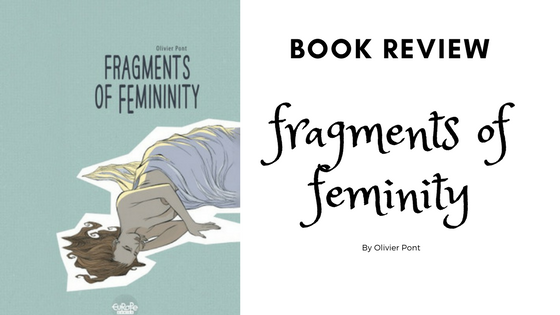 Fragments of Femininity by Olivier Pont and Laurence Croix is a sorry attempt at showing women in various situations in their life and taking charge of their lives. The graphic novel introduces us to seven women who are on their way to discovering themselves, and all stories fall terribly short. There isn’t a moment of recognition, nor resemblance. All the women are ‘bold’. That’s it. They aren’t vulnerable, nor dynamic. They almost seem robotic in their approach to life with no concern for consequence. The women are almost childish in that sense. The storylines have a melancholy to them. No punchlines, no climax. Two of the stories try to surprise you, but leave you hanging by the lack of any emotion involved. The stories get boring after a certain point, almost compelling you to leave the novel all by itself. But, since I got an ARC from NetGallery, I knew I had to finish the novel book to give an honest review. This book gets 2/5 stars from me. If you’re new to reading, are looking to just dip into familiar territory, or finding a gift for someone you’re not particularly fond of this book may be a good pick for you. However, if you’re looking to get challenged, surprised, and excited, this is the wrong novel.